Power Pole asset tags for identification purposes. Long Lasting Utility Tags. Available in aluminum, stainless or brass in a multitude of shapes and sizes. Pie shaped tags available in .025 thickness. Aluminum tags can also be made in an array of colors. Consecutively numbered and/or stamping available. Hole punching can be in the center of the tag or the top center. 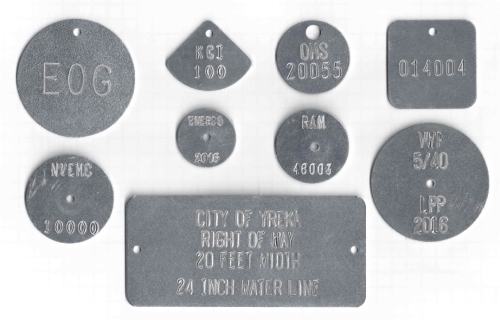 Stamped Round Aluminum Valve Tags available in 1/2", 3/4", 1", and 1 1/4" sizes. Select Size option 1/2" 3/4" 1" 1 1/4"
Fax or email your drawing to 918-970-4101 or to customerservice@tagplace.biz.